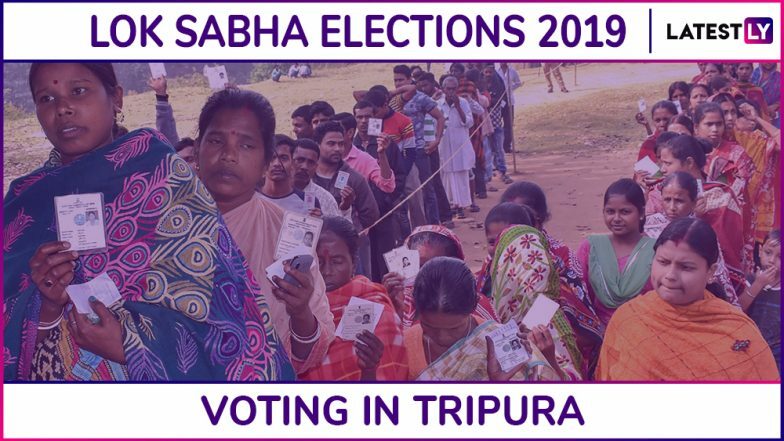 Agartala, April 11: The voting in the first phase of 2019 Lok Sabha Elections is underway. 68.65 per cent voting was recorded till 3 pm. Polling for Phase 1 Lok Sabha Elections 2019 concluded at 6 pm. Over 80.4 % voting was registered. The state of Tripura has two constituencies, i.e. Tripura East, and Tripura West. However, it is the electorate of Tripura West, who will be polling in the first phase of Tripura Lok Sabha Elections today. The constituency also houses the capital of the state, i.e. Agartala. The history of the Tripura West constituency signals that it has been the bastion of Communist Party of India- Marxist (CPI-M), since the first General Elections that took place in 1952. The CPI-M has won 12 times in Tripura West, out of the 17 times the elections have taken place till 2014 General Elections. In the previous Lok Sabha Elections, Sankar Prasad Datta of CPI-M won the Tripura West seat by nearly 700,000 votes, with a vote share of a staggering 62 per cent. The victory margin to the second-placed Congress’s candidate was over 500,000 votes. Tripura Lok Sabha Elections 2019 Dates: Complete Schedule of Voting And Results For General Elections. In Lok Sabha Elections 2019, there are three key candidates in the fray. It will be a three-way fight on Tripura West seat amongst Rebati Tripura from Bharatiya Janata Party (BJP), Subal Bhowmick from Indian National Congress (INC), and Sankar Prasad Datta of CPI-M. Check Full Schedule of Lok Sabha Elections 2019. The key assembly segments that are covered in Tripura West constituency are Agartala, Bamutia, Barjala, Khayerpur, Mohanpur, and Simna (ST). There are a total of 30 Assembly segments in the constituency. Given how the political dynamics have changed in the state in the last couple of years, it will be interesting to see how the votes swing in favour of the political parties in the fray. The Election Commission of India (ECI) has announced that the upcoming Lok Sabha Elections will see the usage of Electronic Voting Machines in all of the polling stations. The voters will also be able to check their votes through Voter Verifiable Paper Audit Trail (VVPAT) – something which will minimalise the suspicion of EVM hacking. Along with Tripura, people in Andaman & Nicobar Islands, Andhra Pradesh, Arunachal Pradesh, Assam, Bihar Chhattisgarh, Jammu and Kashmir, Lakshadweep, Maharashtra, Manipur, Meghalaya, Mizoram, Nagaland, Odisha, Sikkim, Telangana, Uttar Pradesh, Uttarakhand, and West Bengal will also be voting today.